Due to the devastation brought by Super Typhoon Yolanda in Tacloban City, Region 8, concerned examinees in that Region are advised to take the Special CSE-PPT and the Fire Officer Examination in Cebu City on December 15, 2013. Other examinees who are not able to take said examinations in Cebu City shall be allowed to take the examination in the next CSE-PPT which is tentatively set in April 2014 or the FOE in March 2014 based on the 2014 Examination Calendar. For further inquiries, applicants are advised to contact the CSCRO 7 (Cebu City) at telephone numbers (032) 414-7488 or 414-7676 or email at cscro7@yahoo.com, and CSCRO 8 (Tacloban City) at telephone numbers (053) 323-2962 or 524-9180. 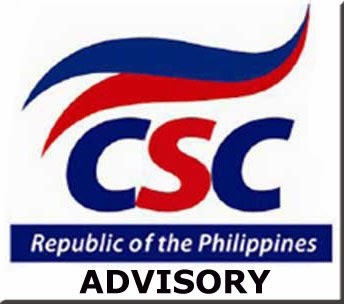 You may also contact the Examination, Recruitment and Placement Office (ERPO) at telephone numbers (02) 931-80-89 or 931-8163 or email at erpo@webmail.csc.gov.ph.